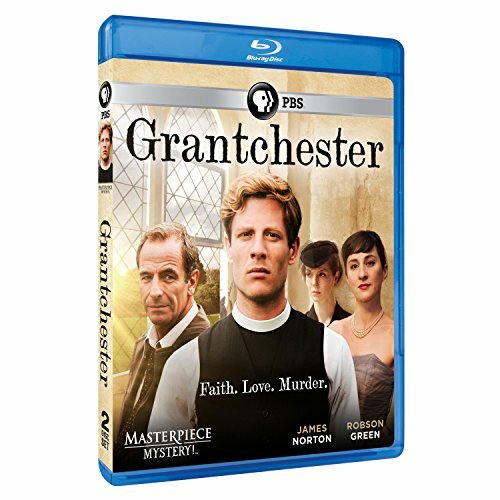 Arlington, Va. � March 26, 2015 � PBS Distribution announced today it is releasing Masterpiece Mystery: Grantchester on DVD and Blu-ray April 7, 2015. "As a priest, isn't everything our business?" asks Reverend Sidney Chambers as he gets to the bottom of another baffling murder around the placid village of Grantchester. James Norton ("Death Comes to Pemberley") stars as the handsome, jazz-loving vicar, with Robson Green as his law-enforcement ally, Inspector Geordie Keating, in GRANTCHESTER. Based on the acclaimed novel "Sidney Chambers and the Shadow of Death" by James Runcie, GRANTCHESTER hearkens back to a simpler England, when World War II had just ended, Elizabeth II was the new queen, and the local vicar was the pillar of the community. Runcie styled Sidney after his late father, Lord Runcie, who was Archbishop of Canterbury in the 1980s. Like Sidney, the elder Runcie was a war hero before he entered the ministry, and he was a compassionate and amiable parish priest. Unfortunately, he never took up crime-solving. GRANTCHESTER corrects that oversight. Also starring are Morven Christie ("Case Histories") as Amanda Kendall, Sidney's first love and soul mate; Tessa Peake-Jones ("Poirot") as Mrs. Maguire, the vicar's morally judgmental landlady; Al Weaver ("Sherlock") as Leonard Finch, the church's new assistant curate; and German actress Pheline Roggan as Hildegard Staunton, the strikingly beautiful widow of the series' first victim. GRANTCHESTER will be available on DVD and Blu-ray April 7, 2015. The run time of this program is approximately 360 minutes on 2 discs. The DVD SRP is $34.99 and the Blu-ray SRP is $39.99. The program will also be available for digital download. It all begins with a sad but predictable suicide. Lawyer Stephen Staunton in nearby Cambridge has been drinking heavily and is deeply in debt. Late one night, he turns his old service revolver on himself, leaving behind a blood-spattered suicide note and a grieving widow. It's an open-and-shut case, according to Geordie, who is the overworked police inspector in charge of the investigation. But people confide things in a parish priest that they never tell police � which is how Sidney comes to suspect murder. His first hurdle is to convince Geordie that there's more to Staunton's death than meets the eye. Fortunately, the cleric and the cop bond over their war service, their love of a good pub, and their competitive instincts � in this case, for backgammon. It's the start of a beautiful friendship that takes Sidney and Geordie through a series of challenging cases, revealing the dark side of early 1950s England � jealousy, prejudice, class conflict, and plain old passion. The last emotion is not exactly unknown to Sidney, who is an unusually worldly clergyman. His pursuit of love is as much a part of the story as his tireless search for justice, spiritual fulfillment, and a really hip jazz club. GRANTCHESTER is a Co-Production of Lovely Day and MASTERPIECE. The Executive Producer for Lovely Day is Diederick Santer. The Executive Producer for MASTERPIECE is Rebecca Eaton. The Producer is Emma Kingsman-Lloyd. The Directors are Harry Bradbeer, Jill Robertson and Tim Fywell. Adapted from the novel "Sidney Chambers and the Shadow of Death" by James Runcie, the series is written by Daisy Coulam. MASTERPIECE is presented on PBS by WGBH Boston. Rebecca Eaton is Executive Producer. Viking River Cruises is the exclusive corporate funder of GRANTCHESTER on MASTERPIECE on PBS, with additional funding provided by The MASTERPIECE Trust.